Pai Northern Thai Kitchen is the new venture by owners of Sukhothai, Sabai Sabai Kitchen and bar, and Khao San Road. After deciding to depart from Khao San Road, Nuit and Jeff Regular opened Pai. The name comes from a city in the Northern region of Thailand, and is where Nuit and Jeff met. Jeff was traveling to (and later returned to live for nine months) Thailand and Nuit was working as a nurse, but they immediately fell in love. Nuit would spend her spare time cooking, which led to the two of them to open a restaurant in Thailand. Eventually the pair moved to Toronto and began their culinary journey. Janet Zuccarini (Gusto 101) is also a co-owner. The restaurant is designed to mimic the town of Pai, with an open kitchen, just like the street markets, artwork and prints from the area, and a hippie, casual vibe. Drinks include Thai iced tea complete with condensed milk, Thai beers, unique cocktails, coconut water and fresh juices. My cocktail of choice was topped with gin, lime, lemongrass syrup and muddled with mint and Thai basil. The flavour combinations really worked well for a refreshing drink. As for the food, we stared with Tom Yum Soup which was the perfect amount of sour, extremely spicy, and filled with Thai flavours. 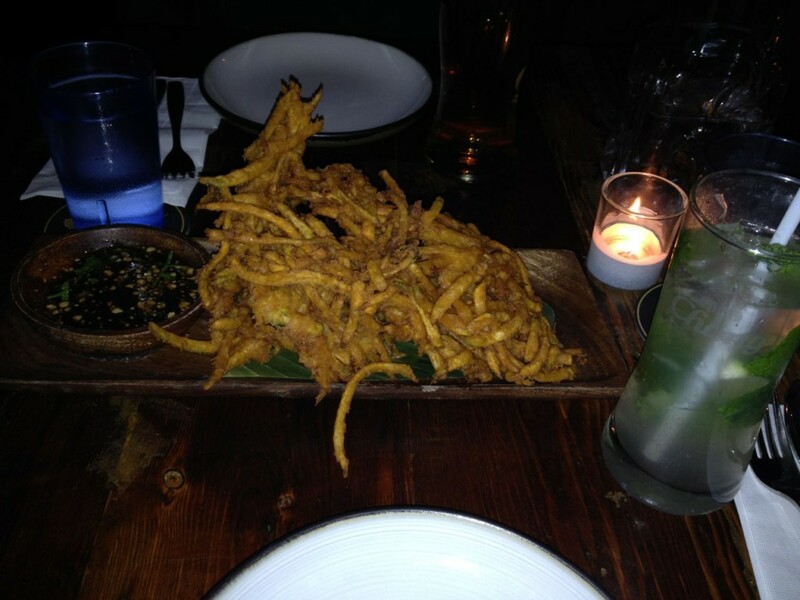 As an appetizer, and brought over from Khao San Road is the squash fritters with a garlic tamarind dipping sauce. The thin strips of deep fried squash all stuck together make for an interesting, pull apart, tasty treat. 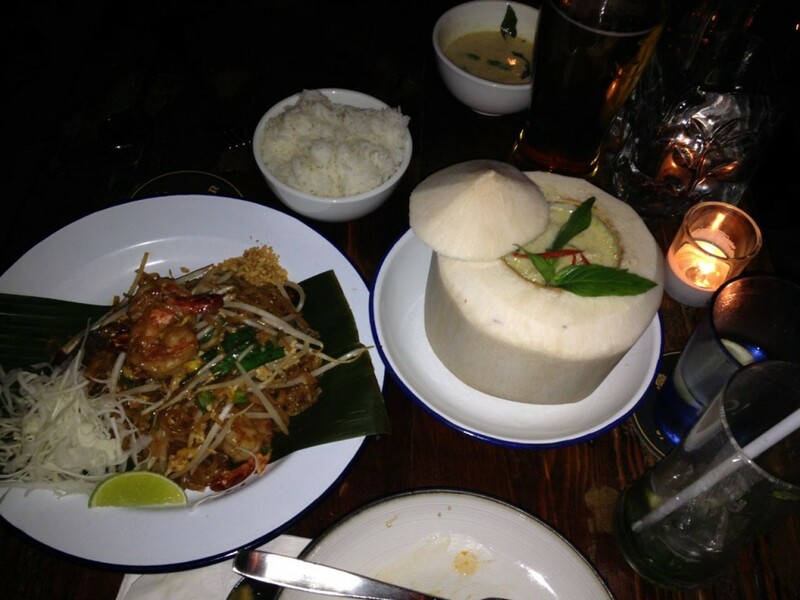 Keeping it simple for the main course, shrimp pad thai and chicken green curry were ordered. The stir fried rice noodles in a homemade tamarind sauce with bean sprouts, tofu, egg, chives, Thai coriander, fresh lime and home roasted peanuts tasted perfectly authentic, with the right amount of sauce and stickiness. The only thing negative that I wish I didn’t experience was that the shrimp tasted a bit off, a little too fishy. We let the restaurant know just for their own good to make sure it was safe to serve to other customers. They were kind enough to take it off our bill (which wasn’t the reason for our complaint). 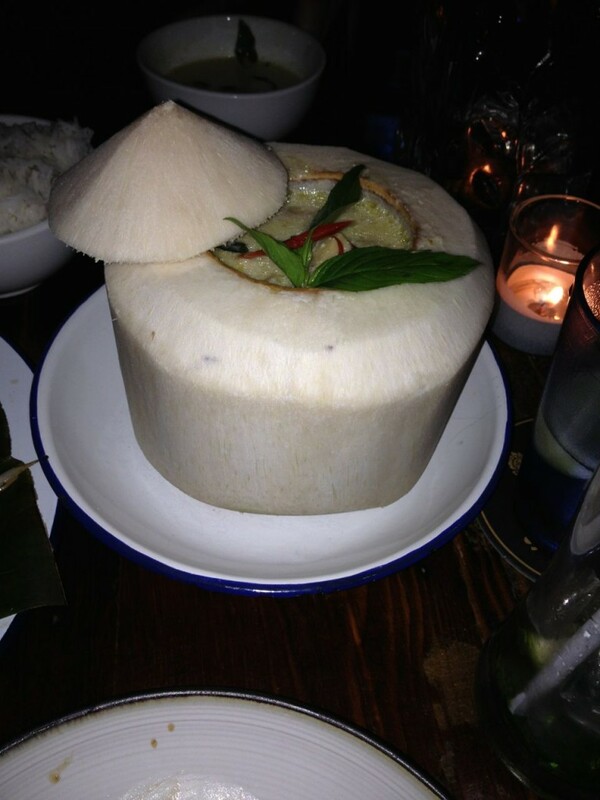 The green curry with chicken was served in a hollowed out coconut, which was a creative display. Be careful with spice here, we ordered mild and I found it a little spicy! The creamy coconut milk sauce with bamboo shoots, kaffir lim leaves, basil leaves, green and red peppers was a delightful dish, with wonderful flavours. If you are looking for a casual, yet authentic Thai experience, head to Pai Northern Kitchen at 18 Duncan Street.